These highlights do not include all the information needed to use AZOPT ® safely and effectively. See full prescribing information for AZOPT ®. AZOPT® is a carbonic anhydrase inhibitor indicated for in the treatment of elevated intraocular pressure in patients with ocular hypertension or open-angle glaucoma (1). Instill one drop in the affected eye(s) three times daily (2). If more than one topical ophthalmic drug is being used, the drugs should be administered at least ten (10) minutes apart (2). Solution containing 10 mg/mL brinzolamide (3). Corneal edema may occur in patients with low endothelial cell counts (5.2). Most common adverse reactions are blurred vision and bitter, sour or unusual taste (6.1). There is a potential additive effect of the known systemic effects of carbonic anhydrase inhibition in patients receiving both oral and topical carbonic anhydrase inhibitors (7.1). Rare instances of acid-base alterations have occurred with high-dose salicylate therapy (7.2). The recommended dose is one drop of AZOPT® (brinzolamide ophthalmic suspension) 1% in the affected eye(s) three times daily. AZOPT® (brinzolamide ophthalmic suspension) 1% may be used concomitantly with other topical ophthalmic drug products to lower intraocular pressure. If more than one topical ophthalmic drug is being used, the drugs should be administered at least ten (10) minutes apart. Solution containing 10 mg/mL brinzolamide. AZOPT® (brinzolamide ophthalmic suspension) 1% is contraindicated in patients who are hypersensitive to any component of this product. AZOPT® (brinzolamide ophthalmic suspension) 1% is a sulfonamide and although administered topically it is absorbed systemically. Therefore, the same types of adverse reactions that are attributable to sulfonamides may occur with topical administration of AZOPT® (brinzolamide ophthalmic suspension) 1%. Fatalities have occurred, although rarely, due to severe reactions to sulfonamides including Stevens-Johnson syndrome, toxic epidermal necrolysis, fulminant hepatic necrosis, agranulocytosis, aplastic anemia, and other blood dyscrasias. Sensitization may recur when a sulfonamide is re-administered irrespective of the route of administration. If signs of serious reactions or hypersensitivity occur, discontinue the use of this preparation. Carbonic anhydrase activity has been observed in both the cytoplasm and around the plasma membranes of the corneal endothelium. There is an increased potential for developing corneal edema in patients with low endothelial cell counts. Caution should be used when prescribing AZOPT® (brinzolamide ophthalmic suspension) 1% to this group of patients. AZOPT® (brinzolamide ophthalmic suspension) 1% has not been studied in patients with severe renal impairment (CrCl < 30 mL/min). Because AZOPT® (brinzolamide ophthalmic suspension) 1% and its metabolite are excreted predominantly by the kidney, AZOPT® (brinzolamide ophthalmic suspension) 1% is not recommended in such patients. The management of patients with acute angle-closure glaucoma requires therapeutic interventions in addition to ocular hypotensive agents. AZOPT® (brinzolamide ophthalmic suspension) 1% has not been studied in patients with acute angle-closure glaucoma. The preservative in AZOPT® (brinzolamide ophthalmic suspension) 1%, benzalkonium chloride, may be absorbed by soft contact lenses. Contact lenses should be removed during instillation of AZOPT® (brinzolamide ophthalmic suspension) 1%, but may be reinserted 15 minutes after instillation. In clinical studies of AZOPT® (brinzolamide ophthalmic suspension) 1%, the most frequently reported adverse reactions reported in 5 to 10% of patients were blurred vision and bitter, sour or unusual taste. Adverse reactions occurring in 1 to 5% of patients were blepharitis, dermatitis, dry eye, foreign body sensation, headache, hyperemia, ocular discharge, ocular discomfort, ocular keratitis, ocular pain, ocular pruritus and rhinitis. The following adverse reactions were reported at an incidence below 1%: allergic reactions, alopecia, chest pain, conjunctivitis, diarrhea, diplopia, dizziness, dry mouth, dyspnea, dyspepsia, eye fatigue, hypertonia, keratoconjunctivitis, keratopathy, kidney pain, lid margin crusting or sticky sensation, nausea, pharyngitis, tearing and urticaria. There is a potential for an additive effect on the known systemic effects of carbonic anhydrase inhibition in patients receiving an oral carbonic anhydrase inhibitor and AZOPT® (brinzolamide ophthalmic suspension) 1%. The concomitant administration of AZOPT® (brinzolamide ophthalmic suspension) 1% and oral carbonic anhydrase inhibitors is not recommended. Carbonic anhydrase inhibitors may produce acid-base and electrolyte alterations. These alterations were not reported in the clinical trials with brinzolamide. However, in patients treated with oral carbonic anhydrase inhibitors, rare instances of acid-base alterations have occurred with high-dose salicylate therapy. Therefore, the potential for such drug interactions should be considered in patients receiving AZOPT® (brinzolamide ophthalmic suspension) 1%. Pregnancy Category C: Developmental toxicity studies with brinzolamide in rabbits at oral doses of 1, 3, and 6 mg/kg/day (20, 62, and 125 times the recommended human ophthalmic dose) produced maternal toxicity at 6 mg/kg/day and a significant increase in the number of fetal variations, such as accessory skull bones, which was only slightly higher than the historic value at 1 and 6 mg/kg. In rats, statistically decreased body weights of fetuses from dams receiving oral doses of 18 mg/kg/day (375 times the recommended human ophthalmic dose) during gestation were proportional to the reduced maternal weight gain, with no statistically significant effects on organ or tissue development. Increases in unossified sternebrae, reduced ossification of the skull, and unossified hyoid that occurred at 6 and 18 mg/kg were not statistically significant. No treatment-related malformations were seen. Following oral administration of 14C-brinzolamide to pregnant rats, radioactivity was found to cross the placenta and was present in the fetal tissues and blood. There are no adequate and well-controlled studies in pregnant women. AZOPT® (brinzolamide ophthalmic suspension) 1% should be used during pregnancy only if the potential benefit justifies the potential risk to the fetus. In a study of brinzolamide in lactating rats, decreases in body weight gain in offspring at an oral dose of 15 mg/kg/day (312 times the recommended human ophthalmic dose) were seen during lactation. No other effects were observed. However, following oral administration of 14C-brinzolamide to lactating rats, radioactivity was found in milk at concentrations below those in the blood and plasma. It is not known whether this drug is excreted in human milk. Because many drugs are excreted in human milk and because of the potential for serious adverse reactions in nursing infants from AZOPT® (brinzolamide ophthalmic suspension) 1%, a decision should be made whether to discontinue nursing or to discontinue the drug, taking into account the importance of the drug to the mother. A three-month controlled clinical study was conducted in which AZOPT® (brinzolamide ophthalmic suspension) 1% was dosed only twice a day in pediatric patients 4 weeks to 5 years of age. Patients were not required to discontinue their IOP-lowering medication(s) until initiation of monotherapy with AZOPT®. IOP-lowering efficacy was not demonstrated in this study in which the mean decrease in elevated IOP was between 0 and 2 mmHg. Five out of 32 patients demonstrated an increase in corneal diameter of one millimeter. Although no human data are available, electrolyte imbalance, development of an acidotic state, and possible nervous system effects may occur following oral administration of an overdose. Serum electrolyte levels (particularly potassium) and blood pH levels should be monitored. Brinzolamide has a molecular weight of 383.5 and a melting point of about 131°C. It is a white powder, which is insoluble in water, very soluble in methanol and soluble in ethanol. AZOPT® (brinzolamide ophthalmic suspension) 1% is supplied as a sterile, aqueous suspension of brinzolamide which has been formulated to be readily suspended and slow settling, following shaking. It has a pH of approximately 7.5 and an osmolality of 300 mOsm/kg. Each mL of AZOPT® (brinzolamide ophthalmic suspension) 1% contains: Active ingredient: brinzolamide 10 mg. Preservative: Benzalkonium chloride 0.1 mg. Inactives: mannitol, carbomer 974P, tyloxapol, edetate disodium, sodium chloride, purified water, with hydrochloric acid and/or sodium hydroxide to adjust pH. Carbonic anhydrase (CA) is an enzyme found in many tissues of the body including the eye. It catalyzes the reversible reaction involving the hydration of carbon dioxide and the dehydration of carbonic acid. In humans, carbonic anhydrase exists as a number of isoenzymes, the most active being carbonic anhydrase II (CA-II), found primarily in red blood cells (RBCs), but also in other tissues. Inhibition of carbonic anhydrase in the ciliary processes of the eye decreases aqueous humor secretion, presumably by slowing the formation of bicarbonate ions with subsequent reduction in sodium and fluid transport. The result is a reduction in intraocular pressure (IOP). 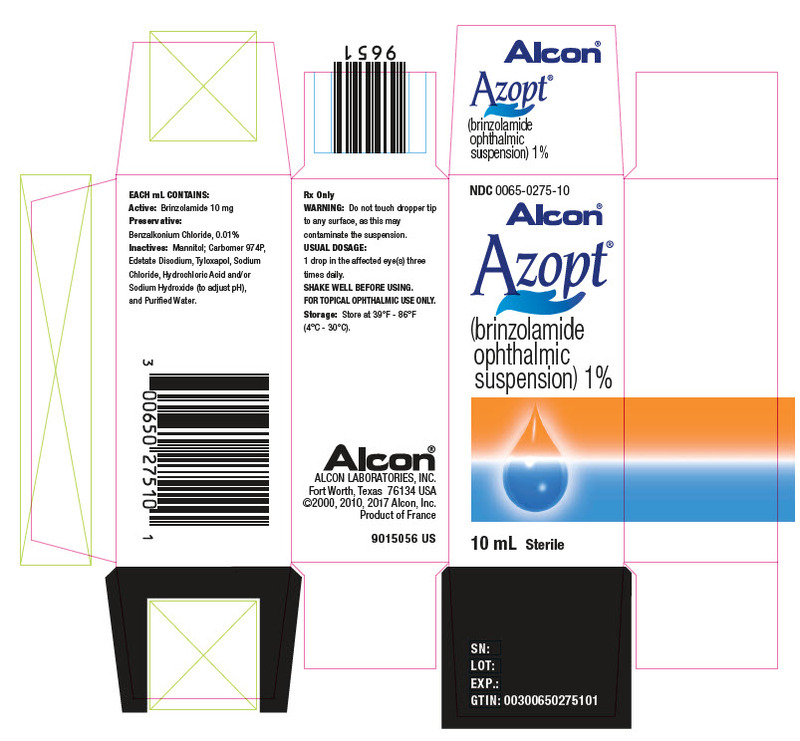 AZOPT® (brinzolamide ophthalmic suspension) 1% contains brinzolamide, an inhibitor of carbonic anhydrase II (CA-II). Following topical ocular administration, brinzolamide inhibits aqueous humor formation and reduces elevated intraocular pressure. Elevated intraocular pressure is a major risk factor in the pathogenesis of optic nerve damage and glaucomatous visual field loss. Following topical ocular administration, brinzolamide is absorbed into the systemic circulation. Due to its affinity for CA-II, brinzolamide distributes extensively into the RBCs and exhibits a long half-life in whole blood (approximately 111 days). In humans, the metabolite N-desethyl brinzolamide is formed, which also binds to CA and accumulates in RBCs. This metabolite binds mainly to CA-I in the presence of brinzolamide. In plasma, both parent brinzolamide and N-desethyl brinzolamide concentrations are low and generally below assay quantitation limits (<10 ng/mL). Binding to plasma proteins is approximately 60%. Brinzolamide is eliminated predominantly in the urine as unchanged drug. N-Desethyl brinzolamide is also found in the urine along with lower concentrations of the N-desmethoxypropyl and O-desmethyl metabolites. An oral pharmacokinetic study was conducted in which healthy volunteers received 1 mg capsules of brinzolamide twice per day for up to 32 weeks. This regimen approximates the amount of drug delivered by topical ocular administration of AZOPT® (brinzolamide ophthalmic suspension) 1% dosed to both eyes three times per day and simulates systemic drug and metabolite concentrations similar to those achieved with long-term topical dosing. RBC CA activity was measured to assess the degree of systemic CA inhibition. Brinzolamide saturation of RBC CA-II was achieved within 4 weeks (RBC concentrations of approximately 20 mcM). N-Desethyl brinzolamide accumulated in RBCs to steady-state within 20 to 28 weeks reaching concentrations ranging from 6-30 mcM. The inhibition of CA-II activity at steady-state was approximately 70 to 75%, which is below the degree of inhibition expected to have a pharmacological effect on renal function or respiration in healthy subjects. Brinzolamide caused urinary bladder tumors in female mice at oral doses of 10 mg/kg/day and in male rats at oral doses of 8 mg/kg/day in 2 year studies. Brinzolamide was not carcinogenic in male mice or female rats dosed orally for up to 2 years. The carcinogenicity appears secondary to kidney and urinary bladder toxicity. These levels of exposure cannot be achieved with topical ophthalmic dosing in humans. The following tests for mutagenic potential were negative: (1) in vivo mouse micronucleus assay; (2) in vivo sister chromatid exchange assay; and (3) Ames E. coli test. The in vitro mouse lymphoma forward mutation assay was negative in the absence of activation, but positive in the presence of microsomal activation. In reproduction studies of brinzolamide in rats, there were no adverse effects on the fertility or reproductive capacity of males or females at doses up to 18 mg/kg/day (375 times the recommended human ophthalmic dose). In two, three-month clinical studies, AZOPT® (brinzolamide ophthalmic suspension) 1% dosed three times per day in patients with elevated intraocular pressure (IOP), produced significant reductions in IOPs (4 to 5 mmHg). These IOP reductions are equivalent to the reductions observed with TRUSOPT* (dorzolamide hydrochloride ophthalmic solution) 2% dosed three times per day in the same studies. In two clinical studies in patients with elevated intraocular pressure, AZOPT® (brinzolamide ophthalmic suspension) 1% was associated with less stinging and burning upon instillation than TRUSOPT* 2%. Store AZOPT® (brinzolamide ophthalmic suspension) 1% at 4 to 30°C (39 to 86°F). Shake well before use. Advise patients that if serious or unusual ocular or systemic reactions or signs of hypersensitivity occur, they should discontinue the use of the product and consult their physician. Vision may be temporarily blurred following dosing with AZOPT® (brinzolamide ophthalmic suspension) 1%. Advise patients to exercise care in operating machinery or driving a motor vehicle. Instruct patients to avoid allowing the tip of the dispensing container to contact the eye or surrounding structures or other surfaces, since the product can become contaminated by common bacteria known to cause ocular infections. Serious damage to the eye and subsequent loss of vision may result from using contaminated solutions. Advise patients that if they have ocular surgery or develop an intercurrent ocular condition (e.g., trauma or infection), they should immediately seek their physician's advice concerning the continued use of the present multidose container. *TRUSOPT is a registered trademark of Merck & Co., Inc.